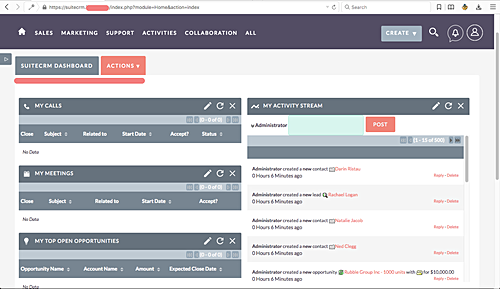 SuiteCRM is an open source CRM (Customer Relationship Management) software based on PHP. It is a fork of the popular CRM software 'SugarCRM', and has become more popular after 'SugarCRM' decided to stop the development of the free version. SuiteCRM has been nominated as the best open source CRM software on BOSSIE 2015 and 2016. 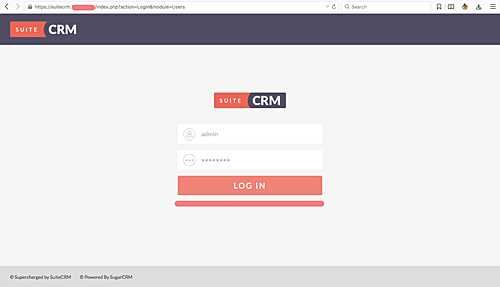 In this tutorial, I will show you step-by-step how to install the open source CRM 'SuiteCRM'. The software will be running under the Nginx web server with MariaDB database and using the Ubuntu 16.04 system. 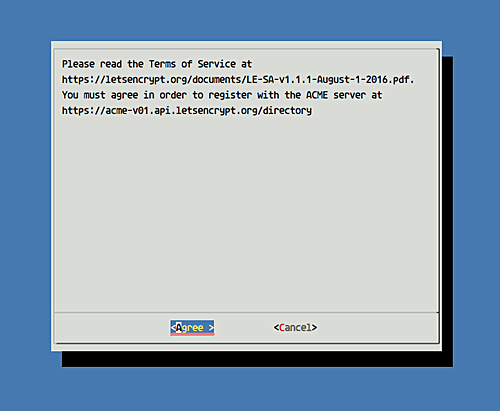 SuiteCRM is a web based software, and it needs a web server. We can use Apache or Nginx for this software. In this tutorial, we will be using the Nginx web server instead of the Apache web server. Connect to your Ubuntu server and update the repository. 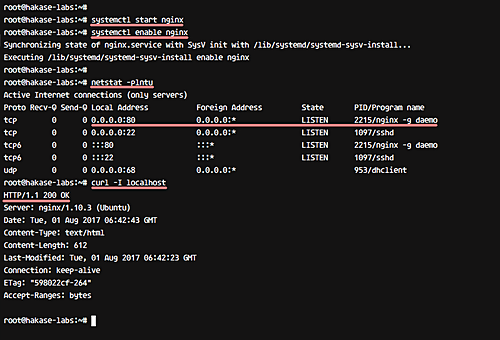 Now install the Nginx web server using the apt command in the following way. After the installation, start nginx and enable it to launch automatically every time at system boot. The Nginx web server is installed, and it's running under the default HTTP port 80. Check it using the netstat command, or you can use curl to see the HTTP status code. SuiteCRM is compatible with multiple PHP versions. In this tutorial, we will be using the newest version PHP 7.0 for SuiteCRM installation. Install PHP and PHP-FPM 7 along with other required extensions using the following apt command. After the installation is complete, go to the PHP configuration directory and edit php.ini files for both 'cli' and 'fpm' configuration. Change the max upload file size value. SuiteCRM needs at least 6MB, but we'll set 100MB as the value. Uncomment the CGI line (shown below) and change the value to 0. For the sessions path configuration, uncomment the line below. That's it. Save these changes and exit. Now, we need to create a new directory for PHP sessions files and change the owner of the directory to 'www-data' user and group. PHP and PHP-FPM configuration has been completed. Now start the service and enable it to launch every time at system boot. By default on the Ubuntu system, PHP-FPM will run under the sock file instead of using system port. Check it using the netstat command below. And make sure the result you see is similar to what's shown in the following screenshot. In this step, we will install MariaDB and configure the root password. Then configure a new database for SuiteCRM installation. 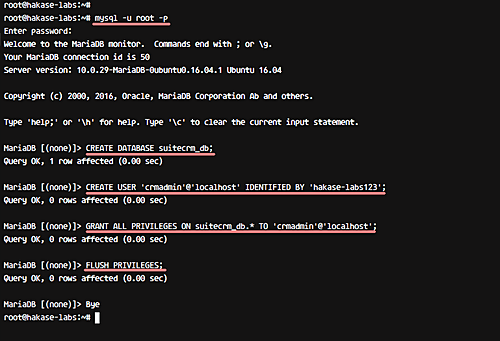 Install MariaDB using the apt command below. After the installation, start the service and enable it to launch every time at system boot. Next, configure the MariaDB root password using the 'mysql_secure_installation' command as below. You will be asked about the configuration, type 'Y' and press 'Enter'. MariaDB root password has been configured. Now we will create a new database and user for SuiteCRM installation. Create a database named 'suitecrm_db', and a new user 'crmadmin' with password 'hakase-labs123'. Connect to the mysql shell and run the following mysql queries. MariaDB database configuration for SuiteCRM installation has been completed. In this step, we will do some tasks that'll prepare the system for SuiteCRM installation. We will download the SuiteCRM source code, configure UFW Firewall, generate Letsencrypt certificates, and configure nginx virtual host for SuiteCRM. The suiteCRM source code is available on Github. Make sure the git command installed on your system. Or if you do not have a git package, install it with the apt command below. Now go to the '/opt' directory and clone the repository using the following git clone command. Go to the suitecrm directory and create a new 'cache' directory. Then change the permission of some files and directories, and finally, we need to change the ownership permissions for the 'suitecrm' directory to 'www-data' user and group. SuiteCRM source code has been downloaded. On Ubuntu, we will be using the ufw firewall. Open new ports HTTP, HTTPS, and SSH using the ufw commands as shown below. Now start the firewall and enable it to launch every time at system boot using ufw enable command. Type 'y' and press Enter to enable the firewall. 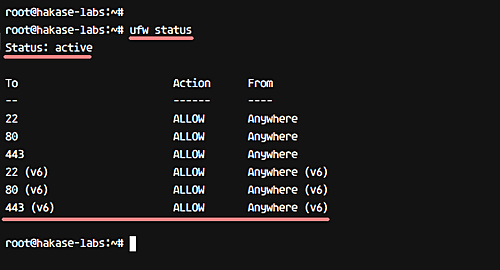 If you want to check the firewall status, use the ufw status command. And you will get the firewall status including what ports you have added. 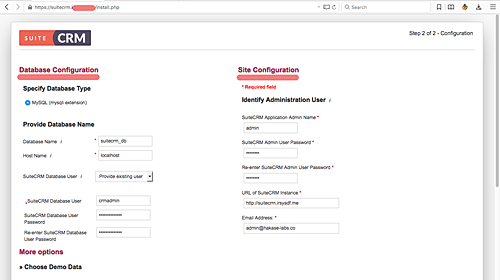 In this tutorial, SuiteCRM will use HTTPS for more secure connection between client and server. For this purpose, we will be using free SSL certificate from Letsencrypt. Before generating certificate files, we need to install letsencrypt client agent on the system. It's available in the Ubuntu repository, so install it with the apt command below. After installing letsencrypt, we need to stop nginx service before generating certificate files. 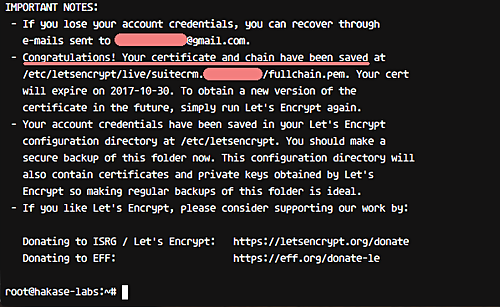 Now generate SSL Certificate files using the letsencrypt command below. Note: The --standalone option will create a temporary web server on the system, so we need to stop the Nginx web server before generating certificate files. You will be asked about your email address for renewing notification. Type your email address and click 'OK'. For the Letsencrypt Agreement, choose 'Agree' and press Enter. New Letsencrypt SSL has been generated in the '/etc/letsencrypt/live/domain.com' directory. Go to the Nginx configuration directory and create a new virtual host file 'suitecrm' in the 'sites-available' directory. Paste the following Nginx configuration there. Now activate the virtual host, test the configuration, and make sure there is no error. Then restart the web server. System configuration for SuiteCRM installation has been completed. You will be redirected to the HTTPS connection and the install.php page. 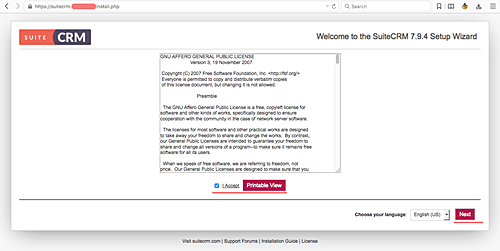 On the page that appears, you will see the GNU AFFERO License - check on the 'I Accept' and click 'Next'. 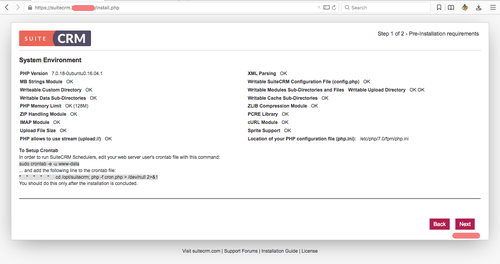 Now you will get the page about system environment for SuiteCRM installation. Make sure all results are 'OK' as shown in the picture below. Next comes database and admin user configuration. Type your database info, dbname 'suitecrm_db', dbuser 'crmadmin' with password 'hakase-labs123'. And type your admin user, password, and email as shown below. Scroll to the bottom and click 'Next' to continue installing SuiteCRM. Wait for a moment for the installation, and when it's complete, you will be redirected to the login page as below. Type your admin user and password, and click the 'Log in' button. Now you'll be able to see the default SuiteCRM dashboard. SuiteCRM has been installed with Nginx web server on the Ubuntu 16.04 system. For this last step, we will create a new Cron job under www-data user. Run the command below to add a new Cron job. Paste Cron script configuration below. Save and exit. Then restart the Cron service. The SuiteCRM installation on Ubuntu 16.04 has been completed. Thank you for the easy to use tutorial.